“Roy Lindsay Kellock was born in Perth, Ontario, on November 12, 1893. He was the son of James Francis Kellock and Annie McDonald. He graduated from McMaster University with a B.A. in 1915 and began articling in 1917 with R.E. Gray in Toronto. Called to the bar in 1920, he joined Donald, Mason, White & Foulds in Toronto, where he practised law for 22 years. He was appointed to the Ontario Court of Appeal in 1942 and to the Supreme Court of Canada on October 3, 1944. During his term on the Supreme Court, he often acted as arbitrator or conciliator in railway labour disputes across Canada. With his colleague, Justice Robert Taschereau, he co-chaired the 1946 Royal Commission on Spying Activities in Canada, which was set up as a result of the so-called ‘Gouzenko Affair.’ He served on the Supreme Court for 13 years and retired on January 15, 1958. 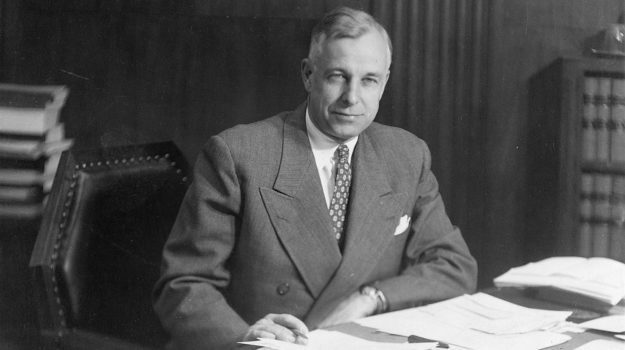 Justice Kellock died on December 12, 1975, at the age of 82” (Supreme Court of Canada, “The Honourable Mr. Justice Roy Lindsay Kellock,” www.scc-csc.gc.ca). Kellock was a Supreme Court justice for several groundbreaking civil liberties cases of the 1950s. Although he did not take part in the Roncarelli case, he supported the decision to quash provincial legislation in the Padlock and Saumur cases. In Saumur, he argued that fundamental freedoms of worship and the press did not fall under section 92 of the British North America Act, which assigned “Property and Civil Rights” to the jurisdiction of the provinces.